Sometimes a little gift book comes along that has that particular knack for delighting anyone of any age--not only due to the nature of its imagery, but its messaging, too. 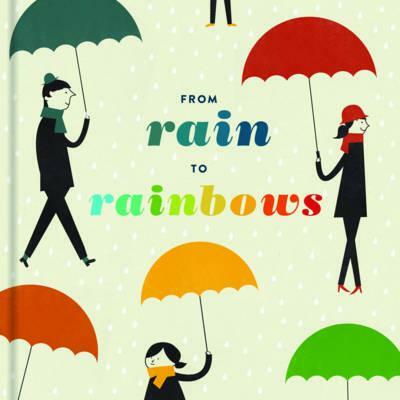 From Rain to Rainbows is a collection of beautiful illustrations, beginning with rain, that slowly morph into a series of rainbows as the book progresses. As the introduction says, both rain and rainbows have the capacity to bring happiness--if we let them, and these images will certainly make anyone and everyone smile. 120 delightful pages feature artists from all over the world, including Bianca Gómez, Amy Rowan, Gemma Correll, Laura Berger, Paula Mills, Jamie Shelman, Sarah Applebaum, Yuko Shimizu, Marc Johns, James Wyper and My Zoetrope. Priceless for lovers of illustration--and a delightful visual romp for children from baby to teen.